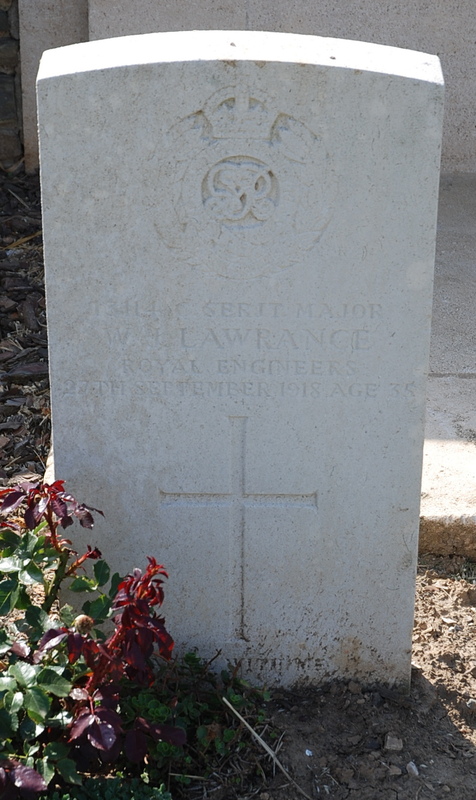 William Lawrance was a regular soldier who rose through the ranks to Company Sergeant Major with the Royal Engineers, Guards Division. He spent most of the war in England but was sent to France in April 1918 and was killed only six weeks before the end of the war, during the crossing of the Canal du Nord. William John Lawrance was born on 5 February 1883 at Fisher Street, Sandwich, Kent, the fourth child and only son of William Henry Lawrance (1842–1888) and his wife Bertha Johanna née Farley (1857–1915). William Henry Lawrance had been born at Woodnesborough, near Sandwich in 1842 and followed his father into the Merchant Navy. In August 1866, he received his Certificate of Competency as a Second Mate from the Board of Trade, but continued to live with his parents in Fisher Street in Sandwich. The couple’s first child, Lilian Louise, was born on 2 August 1876, followed by Florence Ada on 29 March 1878 and Ethel Ellen on 16 October 1879. After the birth of William John on 5 February 1883, the couple’s last child, Louisa Beatrice was born on 18 July 1887. 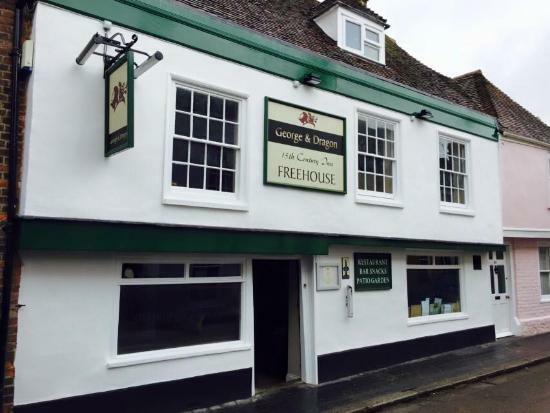 At some time after the birth of William John, William Henry Lawrance left the sea and found employment as a drayman at East Kent Brewery in Sandwich. 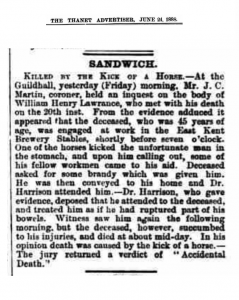 Tragically, he was killed when he was kicked in the stomach by a horse at the brewery stables on 21 June 1888, aged 45, leaving Bertha as a 30-year old widow with five children under 12. At the 1891 census, she and her children were still living in Fisher Street, and Bertha was employed as a laundress. On 30 April 1894, at St. Clement’s Church in Sandwich, Bertha re-married to 36-year old bricklayer John Clayson. Bertha and John had three children: Bertha May, born 25 November 1894, Harry Edgar, born 7 March 1897, and John Claringbull (named for his grandfather), born 28 November 1898, who only lived for five days. The couple continued to live at 6 Fisher Street, Sandwich until Bertha died from lobar pneumonia on 15 November 1915, aged 58. At the time of the 1901 census, William John Lawrence was living with his mother and stepfather at Fisher Street. Aged 18, he was employed as an apprentice carpenter. On 23 July 1910, William, aged 27, married 25-old Maud Mary Little at St. Margaret’s Church in Rochester, Kent. Maud was born in Hammersmith, London on 20 December 1884. Her father, Edward James Little (1845–1896) was a prison warder at the prison at Borstal near Rochester from about 1890 until his death, having previously worked at prisons in west London and Portland, Dorset. At the time of their marriage, William and Maud were living at 8 Mitre Road, Rochester. The couple’s only child, Mary Ellen Dorothy, was born at Seaford, Sussex on 31 October 1912. For some unexplained reason, William and Maud, now resident at 29 Chichester Road, Blatchington near Seaford, were married for a second time at Newhaven Registry Office, on 6 November 1913. At the December 1913 meeting, William Lawrance was balloted for as an initiate into Homestreu Lodge No 3277, meeting at Newhaven, having been proposed by Bro. William Thomas Benjamin Foster, an architect from Seaford and seconded by Bro. George Thomas Godfrey, a builder, also from Seaford. Both brethren were themselves relatively new members of the lodge, having been initiated in November 1910 and November 1911 respectively. Bro. Lawrance subsequently attended the April 1914 meeting, at which he received his Grand Lodge certificate, but he seems not to have attended any further meetings. Having previously served as a volunteer in the 1st Cinque Ports (Royal Garrison Artillery) Battalion, William, aged 20, enlisted at Canterbury on 10 November 1903, joining the Royal Engineers as sapper No 13114. He initially signed on for three years’ service, with a further 9 years in the reserves. He was initially based at the Royal Engineers’ Chatham depot, in ‘D’ Company. Following his enlistment, he was assessed as a “fair” carpenter and in February 1904 as a 3rd Class soldier. On 24 January 1905, now a 2nd Class soldier, he received his first promotion to Lance Corporal (unpaid), following which he extended his period of service to eight years. On 1 September 1905, he was transferred to ‘C’ Company at Chatham with his rank as Lance Corporal now made permanent. In October 1906, he was tested and was assessed as a skilled wheelwright and in January 1908, he attended a course in musketry at Hythe, Kent. He was again promoted on 21 January 1909 to the rank of 2nd Corporal. The rank of 2nd Corporal was peculiar to the Royal Engineers; they wore one chevron like lance-corporals, but unlike the latter, which was an appointment, they held full non-commissioned officer rank. On 4 February, he qualified as an Instructor to the “Territorial Force and Special Reserve”. On 31 October 1910, after an interview and assessment, he extended his period of service to complete 12 years “with the colours”. In March 1911, he was transferred from Chatham to the Royal Engineers training depot at Aldershot, Hampshire, and on 1 May was promoted to the rank of Serjeant Instructor. On 1 September 1911, he was transferred to Seaford in Sussex where he joined the 3/1st Sussex (Fortress) Royal Engineers, part of the South Eastern Coastal Defences, where he was still based at the outbreak of the war. On 5 August 1914, he was assessed as a ‘superior’ wheelwright and on 3 October he received further promotion to Warrant Officer Second Class and (acting) Company Sergeant Major. On 3 August 1915, he again extended his period of service to spend 21 years with the colours. Following this, he was transferred to join the 494th (Home Counties) Field Company, Royal Engineers, initially based at Patrixbourne Camp, near Bridge in Kent, part of the 67th (Home Counties) Division, and later at Driffield in East Yorkshire. In January 1918, he was re-examined and was assessed as a ‘very superior’ wheelwright. His test required him to make a ‘body to (a) handcart’ which he carried out within the allowed time of 20 hours. The test was undertaken in order to qualify him for the Engineers’ pay rate of 2 shillings per day. On 29 March 1918, he returned to Chatham where he briefly joined No 24 Base Depot, before being transferred to the British Expeditionary Force on 4 April. He was shipped to France and, on 3 May 1918, he joined up with the 76th Field Company, Royal Engineers, Guards Division at Monchy-au-Bois, 16km south-west of Arras. The 76th Field Company remained at Monchy-au-Bois until 7 June, where they were engaged on digging, repairing and wiring trenches. On 8 June, they moved 14km north-west to billets at Barly, where they spent four weeks resting, with daily P.E. and weekly church parades. On 6 July, they returned to duty at the village of Blairville, where they fortified the railway station at nearby Boisleux-au-Mont, about 10km south of Arras. This work entailed the demolition of neighbouring properties, the construction of machine gun emplacements and the digging of trenches in front of the station. On completion of this task, the company constructed a bath house at Brétencourt and repaired their accommodation at Blairville after this had been damaged by shellfire. In early August, the company reinforced the tunnel and cave system at Blairville, which had originally been constructed by the German army when they had occupied the area prior to April 1917. On 21 August 1918, the allies begin an attack on a 15km front south of Arras with the 2nd Guards Brigade successfully taking the Arras to Albert railway line at Moyenneville. Following the action on 21 August, the company were engaged on repairing roads in the Hamelincourt and Saint-Léger districts, 10km north of Bapaume. On 3 September, the 76th Field Company moved to new billets at Lagnicourt-Marcel, 11km north-east of Bapaume. In the four months since his arrival in France on 3 May, William and the field company had advanced some 25km east towards the German army’s last line of defence, the heavily fortified Hindenburg Line. Early September was spent on repairing the road from Bapaume to Cambrai in the Boursies district as the Guards advanced towards the Canal du Nord. The Hindenburg Line stretched from the Belgian coast to Verdun, with the main section stretching some 140km from Arras in the north to Soissons in the south – it had been built during the winter of 1916–17 as the last line of German defences on the Western Front. To the west of Cambrai, the defences followed the line of the Canal du Nord; construction of the canal had started in 1908 but was halted at the start of the war. The section near Cambrai was incomplete and “dry”, but still presented a major obstacle being a deep trench across the open countryside. After the German 1918 Spring Offensive had run out of momentum, the allies, reinforced by US troops, launched their ‘100 Days Offensive’ in August to push the German army back to the Hindenburg Line. By late September, the Guards had advanced to the banks of the Canal du Nord, having successfully crossed it and breached the Hindenburg Line to take the village of Havrincourt on 12 September. Early on the morning of 27 September, The Guards launched an attack on the canal defences, taking the enemy by surprise and quickly gaining a foothold on the eastern side of the line, but with heavy casualties, with the Guards Division having over 200 men killed, including the Commanding Officer of the 3rd Guards Brigade, Brigadier-General Gilbert Follett who was killed by a sniper. At 4.00 am on the morning of 27 September, the 76th Field Company left their billets at Lagnicourt and moved to Demicourt to await orders. Once the Guards had secured a crossing of the canal, the Engineers moved in to cut through the causeways on the banks of the canal and construct ramps to allow the passage of infantry and vehicles. Despite working under heavy shellfire the company only suffered light casualties, with a single death, when Lance Corporal Frank Chown was killed by a shell splinter. In the afternoon, the company moved onto the eastern side of the canal and starting building tracks from the canal crossing, to gain access to the Havrincourt – Marquion road (now the D15). Sections finished work at 5.00 pm and returned to the trenches which were the German front line this morning. While billeting sections, No 13114 C.S.M. Lawrance struck by a splinter of shell and died almost immediately. A most valuable Warrant Officer and a very serious loss indeed to this company. On the morning of 30 September, William Lawrence and Frank Chown were buried alongside each other in what is now known as Sanders Keep Military Cemetery. His grave bears the inscription: “Abide with me”. As well as the Masonic Roll of Honour, William is commemorated on the war memorial in his home town, Sandwich, although his name is spelt incorrectly as “Lawrence”. At the time of William’s death, his widow Maud was still living at 29 Chichester Road, Blatchington, but the following year, she returned to Kent and was living at 105 Cecil Road in Rochester. She never re-married and died in Edgware, Middlesex on 26 November 1965, aged 80. Their daughter, Mary Ellen married Frederick Daniels (1912–1958) at Chatham in 1950. They appear to have had no children, and Mary died at Dover on 10 March 1986. Wor. Bro Mike Tubbs, Secretary of Homestreu Lodge No 3277, for extracts from his history of the lodge. 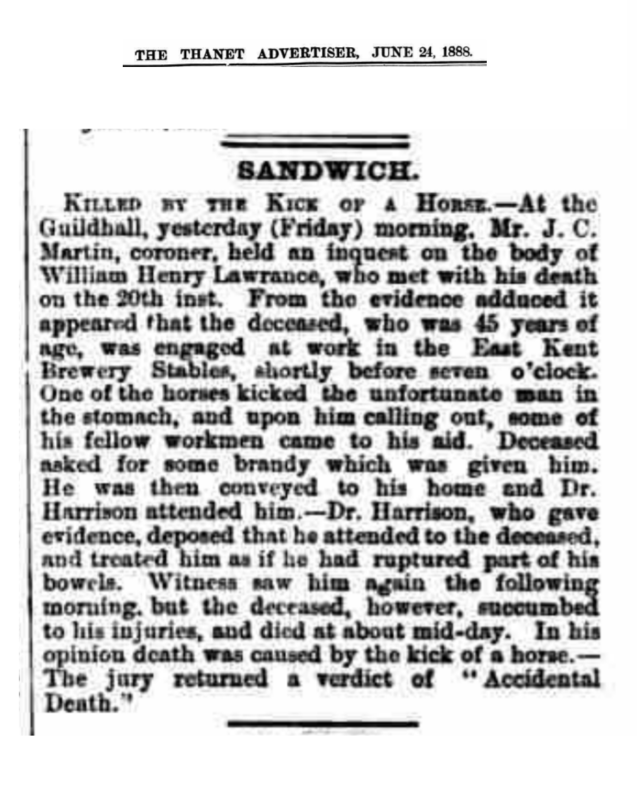 Paul Skelton, of www.dover-kent.com for his help in finding the newspaper report of the inquest into William Henry Lawrance’s death.